We are always at the ready; able to help you with orders, selections and any questions along the way. 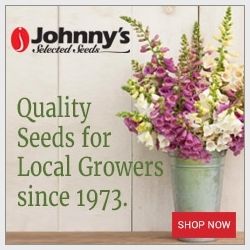 Bethany Little - Co-owner since 1998, sales & shipping manager, floral designer. 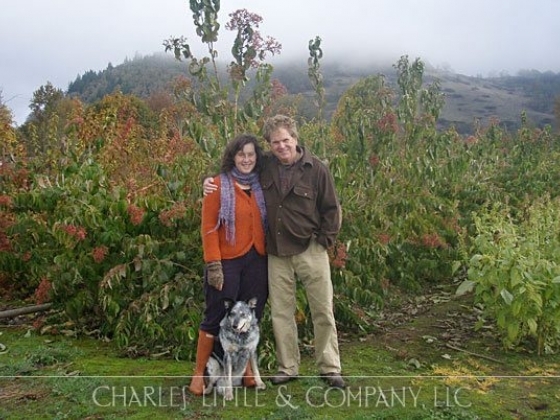 Our farm consists of over 35 acres of the very best river-bottom soil along the Coast Fork of the Willamette River in Oregon. The crops we raise include flowers and foliages of all kinds; ornamental herbs, grasses and grains, and unique sticks, pods and berries. 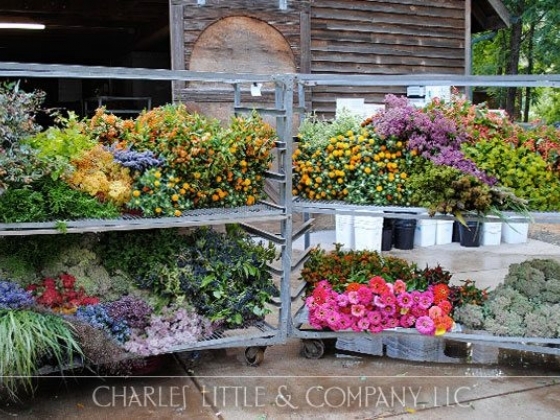 In-season floral materials are available year round to wholesalers throughout the U.S. And they are in a word, excellent! Our product list is long and gets longer every year. This is because top florists and wholesalers are forever hungry for something unique, something they have never seen. It’s our job to provide these kinds of flowers in both quantity and unmatched quality. 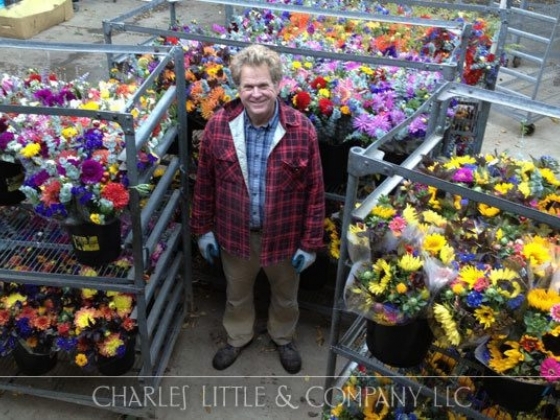 To be sure, a size-able part of our production consists of popular annual and perennial flower specieslarkspur, snapdragons, sunflowers, peonies, calla lilies, lavender—but we have devoted the majority of the acreage to woody shrubs and trees—rows and rows of lushly blooming Viburnum, Ilex, Spirea, Weigela, Hydrangea, Cotinus, Lilac, Snowberry, Cornus, Eucalyptus, ornamental cherries and almonds, even several specialty conifers. This practice has given us a range of floral materials and distinguishes us from many other growers. Over the years these woody-plant areas have become naturalized and require very little weeding or pest control. Indeed, we are committed to cooperating with Mother Nature in every way. All crops produced on the farm are in-season and field-grown without the use of hoop houses or green houses. 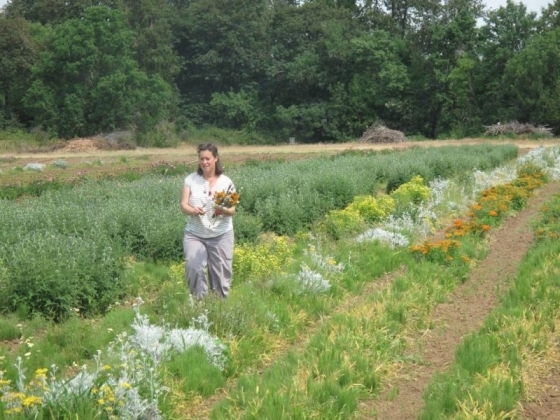 When we conduct field days for other horticulturalists and wholesale buyers, we stress that the southern Willamette Valley is a horticultural paradise making it unnecessary and inappropriate to “beat the season” or otherwise try to control the forces of nature. The farm uses no plastic mulch. Instead, the rows are cultivated with a high clearance tractor and hand weeded by the farm crew. 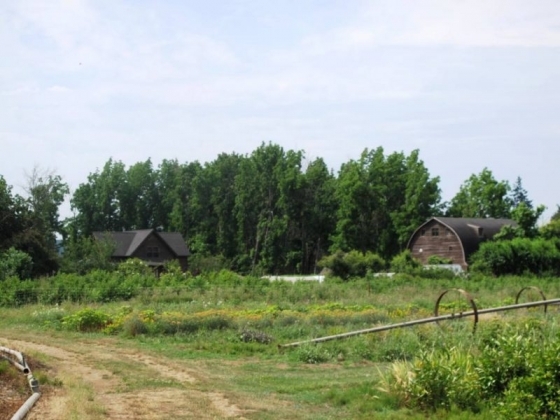 Founded on the very property still being farmed today, the farm now supports several local families with many of the employees having worked here for more than 10 years. Flower-farming is an intensive kind of agriculture, requiring highly skilled workers. During the growing season we employ 10 to 15 people. The acreage is located at the foot of Mt. Pisgah, just a few miles from the Eugene city limits. With Buford Park and Mt. Pisgah Arboretum just across the river, picnickers and hikers drive past our fields, often stopping at our U-Pick facility, open a couple of days a week, June through October. We coordinate field trips on the farm for school groups, summer camps and garden clubs and conduct tours and workshops. Visitors often encounter local artists, some quite well-known, who set up their plein-aire easels amid the rows of flowers, surmounted by Mt. Pisgah rising in the distance. Some of those paintings may be found on this website. As subsequent sections of this website will show, our farm produces a great variety of beautiful flowers. But it also provides a sense of “rightness” for its owners, its staff, its visitors, and, we believe, its customers. This is a good farm, and a good place.